This summer has reinforced the great British love of visiting amusement and theme parks. The fabulous weather has been a godsend to these venues. An increased amount of visitors are taking advantage of a thoroughly enjoyable, dry day out. Globally, attendance at the world’s top theme park groups increased by 8.6% from 438 million to 476 million visitors in 2017. Figures suggest that this year, it will be even higher. Globally, Disney theme parks dominate the market, with the USA leading the way in numbers and profit. In 2017 in the UK, surprisingly, Legoland came out ahead of both Alton Towers and Thorpe Park in terms of attendance and profit. However, the usual suspects of bad weather, economic decline and political instability last year are the main reasons behind a less-than-enthusiastic public and lacklustre results. There is constant pressure on theme park and amusement parks to enhance the experience to attract more visitors. Unfortunately, confidence has been hit when it comes to new rides. Too many teething problems and horror stories have emerged in the past few years and the public are therefore wary of racing to try new rides. So the call is for new attractions to be multifaceted to embrace new technologies. Virtual reality is well established in the gaming world and some believe that it has a future in theme parks. The idea is that VR can revitalise an old ride with significantly less cost than building a brand new one. It can also add a new dimension to a branded attraction. This is exemplified by Europa-Park in France developing a new VR Paddington attraction and Hong Kong set to open its first VR roller coaster. Augmented reality is another revelation that can be of use to theme parks. AR overlays the real world with the digital world, rather than replacing it. Both Disney and Apple are expressing interest in the AR trend. Disney filed a patent for projection-based AR to enable visitors to experience AR without headsets. The technology is in its infancy but it is one to be watched. Disney is also looking further into bots, filing a patent for robot characters. Japan based theme park Huis Ten Bosch has announced that two thirds of its staff will be replaced by robots. This leads to speculation that bots could have a future in managing the infrastructure of attractions and reducing labour costs. Finally, facial and voice recognition are expected to play a major role in the design and operation of interactive rides in the future where guests control the outcome or path of the experience. Disney is believed to be looking into rides that can be customised from reading the visitor’s emotional reactions based on facial recognition. 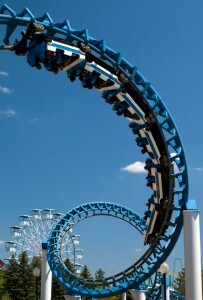 Amusement and theme parks are constantly evolving to make the experience even better for visitors. Modern technology is expected to play a major role in the future. With this new level of sophistication comes an opportunity for street vendors and caterers to provide food and beverages that challenge the traditional fare of burger, chips, pizza and hot dogs. The price of theme park entry encourages a full day visit rather than a few hours. Catering must therefore optimise the opportunity to offer a wide variety of food for all mealtimes.